↑ Marraffini LA, Sontheimer EJ (March 2010). "CRISPR interference: RNA-directed adaptive immunity in bacteria and archaea". Nature Reviews Genetics. 11 (3): 181–90. doi:10.1038/nrg2749. PMC 2928866. PMID 20125085. ↑ Barrangou R (2015). "The roles of CRISPR-Cas systems in adaptive immunity and beyond". Current Opinion in Immunology. 32: 36–41. doi:10.1016/j.coi.2014.12.008. PMID 25574773. ↑ Marraffini LA, Sontheimer EJ (December 2008). "CRISPR interference limits horizontal gene transfer in staphylococci by targeting DNA". Science. 322 (5909): 1843–5. Bibcode:2008Sci...322.1843M. doi:10.1126/science.1165771. PMC 2695655. PMID 19095942. ↑ Sawyer E (9 February 2013). "Editing Genomes with the Bacterial Immune System". Scitable. Nature Publishing Group. สืบค้นเมื่อ 6 April 2015. ↑ Ledford H (2015). "CRISPR, the disruptor". Nature. 522 (7554): 20–4. Bibcode:2015Natur.522...20L. doi:10.1038/522020a. PMID 26040877. ↑ 13.0 13.1 Snyder B (21 August 2014). "New technique accelerates genome editing process". research news @ Vanderbilt. Nashville, Tennessee: Vanderbilt University. ↑ Hendel A, Bak RO, Clark JT, Kennedy AB, Ryan DE, Roy S, Steinfeld I, Lunstad BD, Kaiser RJ, Wilkens AB, Bacchetta R, Tsalenko A, Dellinger D, Bruhn L, Porteus MH (September 2015). "Chemically modified guide RNAs enhance CRISPR-Cas genome editing in human primary cells". Nature Biotechnology. 33 (9): 985–9. doi:10.1038/nbt.3290. PMC 4729442. PMID 26121415. ↑ Ledford H (March 2016). "CRISPR: gene editing is just the beginning". Nature. 531 (7593): 156–9. doi:10.1038/531156a. PMID 26961639. ↑ Maxmen A (August 2015). "The Genesis Engine". WIRED. สืบค้นเมื่อ 2016-06-05. ↑ Ledford H (June 2015). "CRISPR, the disruptor". Nature. 522 (7554): 20–4. doi:10.1038/522020a. PMID 26040877. ↑ Marraffini LA (October 2015). "CRISPR-Cas immunity in prokaryotes". Nature. 526 (7571): 55–61. doi:10.1038/nature15386. PMID 26432244. ↑ Aliyari R, Ding SW (January 2009). "RNA-based viral immunity initiated by the Dicer family of host immune receptors". Immunological Reviews. 227 (1): 176–88. doi:10.1111/j.1600-065X.2008.00722.x. PMC 2676720. PMID 19120484. ↑ Dugar G, Herbig A, Förstner KU, Heidrich N, Reinhardt R, Nieselt K, Sharma CM (May 2013). "High-resolution transcriptome maps reveal strain-specific regulatory features of multiple Campylobacter jejuni isolates". PLoS Genetics. 9 (5): e1003495. doi:10.1371/journal.pgen.1003495. PMC 3656092. PMID 23696746. ↑ 23.0 23.1 Yosef I, Goren MG, Qimron U (July 2012). "Proteins and DNA elements essential for the CRISPR adaptation process in Escherichia coli". Nucleic Acids Research. 40 (12): 5569–76. doi:10.1093/nar/gks216. PMC 3384332. PMID 22402487. ↑ 24.0 24.1 Swarts DC, Mosterd C, van Passel MW, Brouns SJ (2012). "CRISPR interference directs strand specific spacer acquisition". PLoS One. 7 (4): e35888. Bibcode:2012PLoSO...735888S. doi:10.1371/journal.pone.0035888. PMC 3338789. PMID 22558257. ↑ Babu M, Beloglazova N, Flick R, Graham C, Skarina T, Nocek B, และคณะ (January 2011). "A dual function of the CRISPR-Cas system in bacterial antivirus immunity and DNA repair". Molecular Microbiology. 79 (2): 484–502. doi:10.1111/j.1365-2958.2010.07465.x. PMC 3071548. PMID 21219465. ↑ Wiedenheft B, Sternberg SH, Doudna JA (February 2012). "RNA-guided genetic silencing systems in bacteria and archaea". Nature. 482 (7385): 331–8. Bibcode:2012Natur.482..331W. doi:10.1038/nature10886. PMID 22337052. ↑ Beloglazova N, Brown G, Zimmerman MD, Proudfoot M, Makarova KS, Kudritska M, และคณะ (July 2008). "A novel family of sequence-specific endoribonucleases associated with the clustered regularly interspaced short palindromic repeats". The Journal of Biological Chemistry. 283 (29): 20361–71. doi:10.1074/jbc.M803225200. PMC 2459268. PMID 18482976. ↑ Nam KH, Ding F, Haitjema C, Huang Q, DeLisa MP, Ke A (October 2012). "Double-stranded endonuclease activity in Bacillus halodurans clustered regularly interspaced short palindromic repeats (CRISPR) -associated Cas2 protein". The Journal of Biological Chemistry. 287 (43): 35943–52. doi:10.1074/jbc.M112.382598. PMC 3476262. PMID 22942283. ↑ 32.0 32.1 Nuñez JK, Kranzusch PJ, Noeske J, Wright AV, Davies CW, Doudna JA (June 2014). "Cas1-Cas2 complex formation mediates spacer acquisition during CRISPR-Cas adaptive immunity". Nature Structural & Molecular Biology. 21 (6): 528–34. doi:10.1038/nsmb.2820. PMC 4075942. PMID 24793649. ↑ Nuñez JK, Lee AS, Engelman A, Doudna JA (March 2015). "Integrase-mediated spacer acquisition during CRISPR-Cas adaptive immunity". Nature. 519 (7542): 193–8. doi:10.1038/nature14237. PMC 4359072. PMID 25707795. ↑ Nuñez JK, Harrington LB, Kranzusch PJ, Engelman AN, Doudna JA (November 2015). "Foreign DNA capture during CRISPR-Cas adaptive immunity". Nature. 527 (7579): 535–8. doi:10.1038/nature15760. PMC 4662619. PMID 26503043. ↑ Bolotin A, Quinquis B, Sorokin A, Ehrlich SD (August 2005). "Clustered regularly interspaced short palindrome repeats (CRISPRs) have spacers of extrachromosomal origin". Microbiology. 151 (Pt 8): 2551–61. doi:10.1099/mic.0.28048-0. PMID 16079334. ↑ 38.0 38.1 Horvath P, Romero DA, Coûté-Monvoisin AC, Richards M, Deveau H, Moineau S, และคณะ (February 2008). "Diversity, activity, and evolution of CRISPR loci in Streptococcus thermophilus". Journal of Bacteriology. 190 (4): 1401–12. doi:10.1128/JB.01415-07. PMC 2238196. PMID 18065539. ↑ 39.0 39.1 Deveau H, Barrangou R, Garneau JE, Labonté J, Fremaux C, Boyaval P, Romero DA, Horvath P, Moineau S (February 2008). 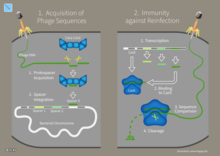 "Phage response to CRISPR-encoded resistance in Streptococcus thermophilus". Journal of Bacteriology. 190 (4): 1390–400. doi:10.1128/JB.01412-07. PMC 2238228. PMID 18065545. ↑ 41.0 41.1 Lillestøl RK, Shah SA, Brügger K, Redder P, Phan H, Christiansen J, Garrett RA (April 2009). "CRISPR families of the crenarchaeal genus Sulfolobus: bidirectional transcription and dynamic properties". Molecular Microbiology. 72 (1): 259–72. doi:10.1111/j.1365-2958.2009.06641.x. PMID 19239620. ↑ 42.0 42.1 Shah SA, Hansen NR, Garrett RA (February 2009). "Distribution of CRISPR spacer matches in viruses and plasmids of crenarchaeal acidothermophiles and implications for their inhibitory mechanism". Biochemical Society Transactions. 37 (Pt 1): 23–8. doi:10.1042/BST0370023. PMID 19143596. ↑ 43.0 43.1 Díez-Villaseñor C, Guzmán NM, Almendros C, García-Martínez J, Mojica FJ (May 2013). "CRISPR-spacer integration reporter plasmids reveal distinct genuine acquisition specificities among CRISPR-Cas I-E variants of Escherichia coli". RNA Biology. 10 (5): 792–802. doi:10.4161/rna.24023. PMC 3737337. PMID 23445770. ↑ 44.0 44.1 Erdmann S, Garrett RA (September 2012). "Selective and hyperactive uptake of foreign DNA by adaptive immune systems of an archaeon via two distinct mechanisms". Molecular Microbiology. 85 (6): 1044–56. doi:10.1111/j.1365-2958.2012.08171.x. PMC 3468723. PMID 22834906. ↑ 45.0 45.1 Shah SA, Erdmann S, Mojica FJ, Garrett RA (May 2013). "Protospacer recognition motifs: mixed identities and functional diversity". RNA Biology. 10 (5): 891–9. doi:10.4161/rna.23764. PMC 3737346. PMID 23403393. ↑ Pourcel C, Salvignol G, Vergnaud G (March 2005). "CRISPR elements in Yersinia pestis acquire new repeats by preferential uptake of bacteriophage DNA, and provide additional tools for evolutionary studies". Microbiology. 151 (Pt 3): 653–63. doi:10.1099/mic.0.27437-0. PMID 15758212. ↑ Tyson GW, Banfield JF (January 2008). "Rapidly evolving CRISPRs implicated in acquired resistance of microorganisms to viruses". Environmental Microbiology. 10 (1): 200–7. doi:10.1111/j.1462-2920.2007.01444.x. PMID 17894817. ↑ Pride DT, Sun CL, Salzman J, Rao N, Loomer P, Armitage GC, และคณะ (January 2011). "Analysis of streptococcal CRISPRs from human saliva reveals substantial sequence diversity within and between subjects over time". Genome Research. 21 (1): 126–36. doi:10.1101/gr.111732.110. PMC 3012920. PMID 21149389. ↑ Goren MG, Yosef I, Auster O, Qimron U (October 2012). "Experimental definition of a clustered regularly interspaced short palindromic duplicon in Escherichia coli". Journal of Molecular Biology. 423 (1): 14–6. doi:10.1016/j.jmb.2012.06.037. PMID 22771574. ↑ Datsenko KA, Pougach K, Tikhonov A, Wanner BL, Severinov K, Semenova E (July 2012). "Molecular memory of prior infections activates the CRISPR/Cas adaptive bacterial immunity system". Nature Communications. 3: 945. Bibcode:2012NatCo...3E.945D. doi:10.1038/ncomms1937. PMID 22781758. ↑ 53.0 53.1 Ledford H (June 2015). "CRISPR, the disruptor". Nature. 522 (7554): 20–4. Bibcode:2015Natur.522...20L. doi:10.1038/522020a. PMID 26040877. ↑ "CRISPR/Cas9 Plasmids". www.systembio.com. สืบค้นเมื่อ 2015-12-17. 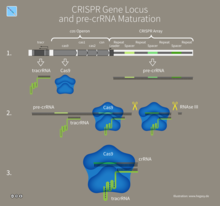 ↑ "CRISPR Cas9 Genome Editing". www.origene.com. OriGene. สืบค้นเมื่อ 2015-12-17. ↑ 58.0 58.1 Ran FA, Hsu PD, Wright J, Agarwala V, Scott DA, Zhang F (November 2013). "Genome engineering using the CRISPR-Cas9 system". Nature Protocols. 8 (11): 2281–308. doi:10.1038/nprot.2013.143. PMC 3969860. PMID 24157548. ↑ Ly, Joseph (2013). Discovering Genes Responsible for Kidney Diseases (Ph.D.). University of Toronto. สืบค้นเมื่อ 26 December 2016. Slaymaker IM, Gao L, Zetsche B, Scott DA, Yan WX, Zhang F (January 2016). "Rationally engineered Cas9 nucleases with improved specificity". Science. 351 (6268): 84–8. doi:10.1126/science.aad5227. PMC 4714946. PMID 26628643. Hale C, Kleppe K, Terns RM, Terns MP (December 2008). "Prokaryotic silencing (psi) RNAs in Pyrococcus furiosus". RNA. 14 (12): 2572–9. doi:10.1261/rna.1246808. PMC 2590957. PMID 18971321. "The age of the red pen". The Economist. August 22, 2015. ISSN 0013-0613. สืบค้นเมื่อ 2015-08-25. หน้านี้แก้ไขล่าสุดเมื่อวันที่ 1 สิงหาคม 2561 เวลา 01:11 น.